Cannellini beans are so darn useful. So are Great Northerns, and if you were a purist, which I am not, you would not agree that they are interchangeable. But in my book, both are lovely, large, all-white and in this recipe, great for a hearty winter soup. 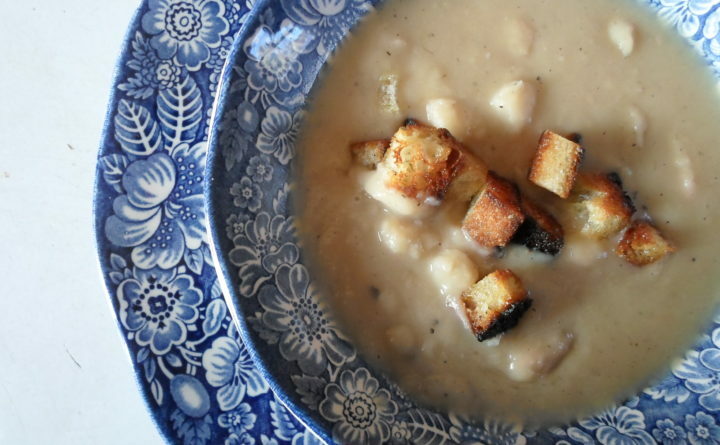 This recipe has its origins in an early 1980s Williams-Sonoma catalogue under the name Tuscan Bean Soup, and I use the basic principles of making it for all kinds of vegetable-bean soups. Water, beans, garlic, olive oil, bay leaves and lemon juice are all you need. Soak the beans and cook them until they are tender. For a speedier version, open a can of cannellinis, add the olive oil, and simmer with the bay leaves and garlic. Then, puree half of it to make a creamy base, add lemon juice to give it a bit of snap, salt and pepper, and a sprinkle of parsley because otherwise it is just white. This basic method works with any kind of dried bean. If you choose canned beans, which is always a good option for saving time, you need enough to yield six to eight servings. Two 15.5-ounce cans or one 28-ounce should do, but look for yourself. That information is right there on the nutrition label. You can see this is a vegan dish, but you can prevent that by adding a bit of ham or sausage, hot or not. There is no lactose, but a dollop of sour cream or thick yogurt is OK if you if think you’d like it. The recipe has no gluten, but you can sprinkle the top with croutons. If garlic gives you heartburn, leave it out and use some kind of herbs instead for flavor such as basil, rosemary or oregano. If you like heat, sprinkle in red pepper flakes. If you want more vegetables in your soup, add sliced cooked carrots or chopped celery and onions. Use a slow cooker or instant cooker if you want. Or stick this soup (in an oven-safe pan, of course) in a low oven, say 250 degrees Fahrenheit for the whole afternoon. I use my bean pot and poked into the wood-burning cookstove oven where it cooks gently all day. It can also be done on the stove. Once you put it all together, you can pretty much ignore it, and just let time and heat work its magic. Just as it is, this bean soup is wicked wholesome. It is extremely affordable but tastes expensive. Serve with good old crusty bread and a salad. On a cold winter night, this soup will warm you and your family from the inside out. 1. If using dried beans, cover soaked beans with water and bring to a boil, adding water to keep them covered. After it comes to a boil, reduce the temperature and cook until the beans are barely tender. 2. If using canned beans, include the liquid and cover with water. 3. Add the bay leaves, garlic and a generous dribble of olive oil. 4. Cook at a low temperature in the oven at 300 degrees Fahrenheit or on the stove at the lowest setting until the beans are tender and falling apart. 5. Puree about half of the beans or use an immersion blender to puree them, leaving about half the contents of the pot whole. 6. Add the lemon juice, then add salt and pepper to taste. Stir in the basil and/or red pepper flakes, if using.